The first meeting of the Science for Nature and People Partnership (SNAPP) working group on compensatory conservation was held in Santa Barbara, California, in the first week of August. This group, led by Martine Maron and James Watson, and supported by Maron Lab members Jeremy Simmonds and Laura Sonter, aims to examine how compensatory approaches like offsets can be harnessed to deliver the best outcomes for biodiversity and people in different parts of the world. In recognition of the differing in-country contexts in which compensatory policies are implemented, the group, comprising stakeholders from private industry, non-government organisations and academia, will examine which approaches—ranging along a spectrum from the funding of protected areas to net gain of biodiversity—are most suitable in particular circumstances. Compensatory conservation is not a ‘one-size-fits-all’ tool—different approaches will be more or less appropriate for different places. Over the next 12 months, this working group will develop the guidance on what is likely to work best, and where. Martine Maron recently contributed a chapter to a new book, “Effective Conservation Science: Data Not Dogma” edited by Peter Kareiva, Michelle Marvier, and Brian Silliman. Martine’s chapter is one of many excellent contributions, including one by Centre for Biodiversity and Conservation Science colleagues James Watson and Richard Fuller on replacing under-performing nature reserves. The book will be published by Oxford University Press in October 2017. PhD candidate Alex Braczkowski was recently awarded the prestigious 2017 Elodie Sandford Explorer award by the Scientific Exploration Society. The Scientific Exploration Society provides high profile Awards for projects that will leave a lasting legacy and benefit in the field in which a winners’ expedition takes place, but also inspire a wider audience to the issues being addressed through film, photography and the pure passion of the recipient. Alex will use his award to perform the first leopard surveys in Uganda, and will also be working with the Wildlife Conservation Society to film Ishasha’s famous tree-climbing lions. It’s no secret that human development frequently comes at a cost to other creatures. As our urban footprint expands, native habitat contracts. To compensate for this, most Australian governments require developers to invest in biodiversity offsetting, where habitat is created or protected elsewhere to counterbalance the impact of construction. Although biodiversity offsetting is frequently used in Australia – and is becoming increasingly popular around the world – we rarely know whether offsets are actually effective. That’s why we spent four years monitoring the program designed to offset the environmental losses caused by widening the Hume Highway between Holbrook and Coolac, New South Wales. Our research has found it was completely ineffective. Wild honeybees occupied many nest boxes. The roadworks required the removal of large, old, hollow-bearing trees, which are critical nesting sites for many animals, including several threatened species. To compensate for these losses, the developer was required to install one nest box for every hollow that was lost – roughly 600 nest boxes were installed. Many of the boxes were specifically designed for three threatened species: the squirrel glider, the superb parrot and the brown treecreeper. We monitored the offset for four years to see whether local wildlife used the nest boxes. We found that the nest boxes were rarely used, with just seven records of the squirrel glider, two of the brown treecreeper, and none of the superb parrot. We often saw all three species in large old tree hollows in the area around the boxes we monitored. Even more worryingly, almost 10% of the boxes collapsed, were stolen or otherwise rendered ineffective just four years after being installed. 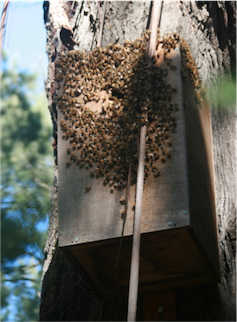 Perversely, we found that invasive species such as feral bees and black rats frequently occupied the nest boxes. The offset clearly failed to deliver the environmental outcomes that were promised. Indeed, researchers have been concerned for some time now that offsetting can be misused and abused. It’s worth noting that research supports using nest boxes as a habitat replacement. However, they may never be effective for species such as the superb parrot. It’s not quite clear why some animals use nest boxes and others don’t, but earlier monitoring projects in the same area found superb parrots consistently avoid them. Still, concrete steps can – and should – be taken to improve similar offset programs. First, the one-to-one ratio of nest boxes to tree hollows was inadequate; far more nest boxes needed to be installed to replace the natural hollows that were lost. Second, nest boxes clearly cannot compensate for the many other key ecological values of large old trees (such as carbon storage, flowering pulses or foraging habitat). This suggests that more effort is needed at the beginning of a development proposal to avoid damaging environmental assets that are extremely difficult to replace – such as large old trees.There also was no requirement to regularly replace nest boxes as they degrade. It can take a hundred years or more for trees to develop natural hollows suitable for nesting wildlife. To truly offset their removal, thousands of boxes may be required over many decades. Third, where it is simply impossible to protect key features of the environment during infrastructure development, more holistic strategies should be considered. For example, in the case of the woodlands around the Hume Highway, encouraging natural regeneration can help replace old trees. Tree planting on farms can also make a significant contribution to biodiversity – and some of these may eventually become hollow-bearing trees. A combination of planting new trees and maintaining adequate artificial hollows while those trees mature might be a better approach. When an offset program fails, it’s unlikely anyone will be asked to rectify the situation. This is because developers are only required to initiate an offset, and are not responsible for their long-term outcomes. 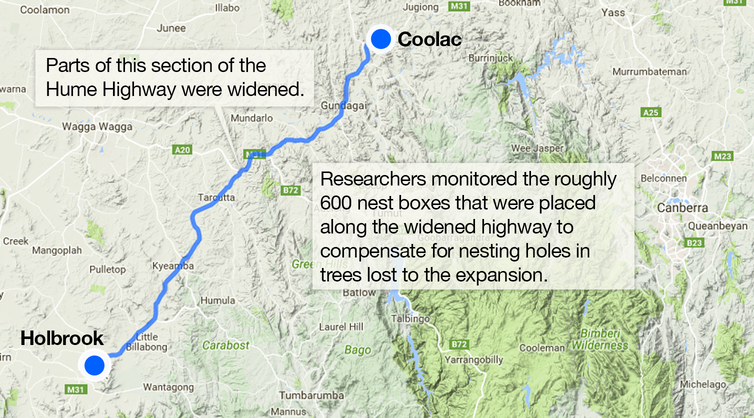 In the case of the Hume Highway development, the conditions of approval specified that nest boxes were to be installed, but not that they be effective. Despite the ecological failure of the offset (and over A$200,000 invested), the developer has met these legal obligations. This distinction between offset compliance and offset effectiveness is a real problem. The Australian government has produced a draft policy of outcomes-based conditions, but using these conditions isn’t mandatory. The poor results of the Hume Highway offset program are sobering. However, organisations like Roads and Maritime Services are to be commended for ensuring that monitoring was completed and for making the data available for public scrutiny – many agencies do not even do that. Indeed, through monitoring and evaluation we can often learn more from failures than successes. There are salutary lessons here, critical to ensuring mistakes are not repeated. PhD candidate Micha Jackson’s work was recently featured on the NESP TSR website, as well as this ABC News story and radio interview. The far eastern curlew, one of the world’s largest migratory shorebirds, has declined dramatically in the last 20 years. According to Micha Jackson the bird is in trouble on multiple fronts and central to addressing these challenges is a better understanding of its habitat needs and international cooperation. The migration route of the far eastern curlew falls within the ‘East Asian-Australasian Flyway’ (EAAF), which it shares with more than 50 other migratory shorebird species. Combined there are more than 8 million shorebirds that pass through more than 20 countries every year. The northern end of the EAAF (where migratory shorebird species breed) includes parts of Russia, China, Mongolia and Alaska, and its southern end (non-breeding habitat) includes parts of south-east Asia, Australia and New Zealand. In the middle lies much of east and south-east Asia, and some islands of the western Pacific. As with all migratory species, if any one critical area in the life cycle is left unprotected, it could spell the collapse of the entire population despite the best efforts elsewhere. All countries along the migration route will need to enact conservation measures to achieve recovery of the far eastern curlew, and these actions will also benefit many other species. Tracking studies over the last 30 years have taught us much about the far eastern curlew’s life-cycle. These studies include the resighting, recording and reporting of bands and flags attached to the legs of curlews as they move through the flyway, and the use of geo-locators and satellite transmitters. It breeds in marshy areas of Russia and northern China, and, as far as we can tell the entire population passes through the Yellow Sea/Bohai Sea region, which includes coastal areas of China, the Democratic People’s Republic of Korea and the Republic of Korea, during migration. This region is therefore a critical stopover area for curlews to rest and refuel while undertaking their gruelling long-distance migration flights. During the non-breeding season, about three quarters of the birds wait out the northern winter in Australia, with others heading to the Philippines, Indonesia, PNG and likely elsewhere. The far eastern curlew has suffered rapid and dramatic population declines in recent decades. The IUCN Red List, which assesses the global status of species, listed it as Least Concern in 2004, but it was rapidly upgraded to Vulnerable in 2010 and to Endangered in 2015. Recent research confirmed an annual decline of almost 6% over the last two decades, and the species was listed as Critically Endangered in Australia in 2016. A key driver of this decline is extensive loss of intertidal mudflat, particularly in the Yellow/Bohai Sea region – where more than half of this habitat has disappeared over the last 50 years. Causes of mudflat loss are multiple and include: coastal developments, which ‘reclaim’ soft, food-filled mudflats using seawalls and convert them into solid land; a reduction in sediment deposits from rivers that have been extensively dammed; and escalating sea-level rise. Other impacts on the species include reduced food supply on remaining mudflats, loss of and changes to breeding habitat, hunting, accidental catch in fishing nets, and pollution. Within Australia, recreational beach goers and dogs are also having a major impact on curlews, disturbing them on ‘roosting’ habitat – important areas where they rest during high tide periods when mudflat feeding grounds are covered with seawater. This shy bird will generally flee from people and dogs when they are more than a hundred metres away and does not readily resettle when disturbed. Coastal developments are also impacting roosting habitat. A new Darwin-based TSR project is addressing key knowledge gaps facing far eastern curlew conservation. In particular, how the birds use different feeding and roosting habitats and which areas are most critical to conserve, particularly in the face of increasing coastal development. Shorebirds will use some artificial habitats, including some wharves, commercial salt works and aquaculture ponds. This project is working with the Darwin Port, where significant numbers of far eastern curlew use the East Arm Wharf as a roosting area. Filling knowledge gaps about feeding and roosting requirements will enable the project to develop conservation guidelines for developers, planners and regulators. Our hope is that improved management of ‘accidental’ habitats like East Arm Wharf, alongside conservation of intertidal mudflat habitat, could help the far eastern curlew and other migratory shorebirds recover. This project also complements a NESP Marine Biodiversity Hub project, which takes a whole-of-north approach to conserving migratory species groups reliant on the marine environment. The new TSR Hub project commenced just as key stakeholders from EAAF countries met in Singapore at the 9th EAAF Partnership ‘Meeting of Partners’. This biennial meeting is the decision-making forum of the Partnership, which commenced in 2006 and is a voluntary, non-legally-binding agreement allowing countries, local governments, NGOs, IGOs, and corporations from throughout the flyway to work together on shorebird conservation initiatives. In response to the dire situation facing the far eastern curlew, a special task force was established at the 2015 Meeting of Partners and at the 2017 meeting, a Single Species Action Plan was endorsed and launched, to guide priority conservation and research actions to help the species recover throughout the flyway. Given the current status of far eastern curlew and its recent dramatic declines, the survival of all individuals remaining in the population is crucial. Australia’s role is to design and implement effective conservation measures at home to protect non-breeding habitat from disturbance and loss of roosting habitat, and to work cooperatively with other flyway countries. Get the full version of this article in Science for Saving Species Magazine. Humans rely on things that come from nature – including clean air, water, food, and timber. But how can we tell if these natural services that people rely on, are at risk of being lost, potentially permanently? That is the focus of a new paper by an international team, led by Dr Martine Maron from The University of Queensland’s School of Earth and Environmental Sciences. “There are many things that happen in nature that provide benefits to people, and we call these ecosystem services,” Dr Maron said. “As well as natural goods, like seafood, crops, and timber, they can also include other things like the well-being benefits of spending time in a park or at the beach, protection from flooding and even regulation of the climate. “Many of these things are essential to people, but until now, there hasn’t been a consistent way to look at whether different ecosystem services are under threat from growing human demand or unsustainable levels of use. “We have developed a framework to identify services that at risk of being undersupplied or even of being lost entirely. This allows time to either move towards more sustainable use, or to start planning for alternatives when we lose the ecosystem service. “At its core, the framework is a method to analyse supply and demand, and the different things that affect them, like the condition of natural systems and whether demand by people is expected to change over time. Dr Matthew Mitchell, a study co-author based at the University of British Columbia, said: “An example we often see in our cities is the loss of vegetation and its ability to intercept rainwater and reduce flooding. Dr Maron said the new framework could provide a basis for global, national and regional assessments of threat to ecosystem services, and accompany existing assessments of threat to species and ecosystems. “As the need to prioritise investment in safeguarding ecosystem services becomes more urgent, a framework for assessing when and where ecosystem services are imperilled is timely,” she said. The study, published in Trends in Ecology and Evolution, is supported by an Australian Research Council Discovery project grant. It involves researchers from UQ; University of British Columbia, Canada; University College, London; University of New South Wales; NSW Office of Environment and Heritage; and the Wildlife Conservation Society, U.S.A.
More was published about biodiversity offsetting in 2016 than ever before, mirroring the increasing influence of this controversial approach to conservation. Here, we highlight some of the key outputs from our research group working on conservation policy with our collaborators from around the world. Most of these are available freely online but if you’d like a copy email me: m.maron@uq.edu.au. In this review, we sought to summarise the full breadth of challenges faced by biodiversity offsetting – in other words, we asked: why are offsets so polarising? Are they good, bad, or better than nothing? We aimed to provide an accessible overview of the issues being so furiously debated in the world of offsets, including the technical, governance, social and even ethical arguments. Thanks to Joe Bull we were able to include a valuable graphical snapshot of where in the world offsets were happening, and under what guises. We hope this is a valuable go-to paper for those seeking an overview of the messy world of offsetting and a starting point for chasing down key research. Bull, J. W., A. Gordon, J. E. Watson, and M. Maron. 2016. Journal of Applied Ecology 53:1686-1693. Narain, D., and M. Maron. 2016. Science 353:758-758. Led by Divya Narain, this short article outlines a major risk to the effectiveness of offsets for forest loss in India: lack of additionality. A valid offset must support conservation that would not otherwise happen – you can’t count conservation already planned or under way. But in 2016, the Indian parliament passed laws allowing for funds intended for offsets for forest clearing (compensatory afforestation) to be redirected to a separate afforestation program which forms part of the country’s National Action Plan on Climate Change. In effect, this double counting will mean 1.2 million hectares of deforestation will remain uncompensated for. Maseyk, F. J. F., L. P. Barea, R. T. T. Stephens, H. P. Possingham, G. Dutson, and M. Maron. 2016. Biological Conservation 204, Part B:322-332. A couple of years ago, Fleur Maseyk led the development of a (voluntary) offset accounting approach for use in New Zealand. One of the important features of that approach was the way in which the different elements of biodiversity that were the focus of the offsets could be disaggregated, ensuring no net loss outcomes for each element. This paper describes this disaggregated model and its development, and notes that despite being designed to estimate biodiversity offset requirements within the largely voluntary New Zealand context, the approach is equally useful for making transparent the set of assumptions behind any offset calculation. Sonter, L., N. Tomsett, D. Wu, and M. Maron. 2016. Biological Conservation. Offset benefits usually take decades to accrue, and data about individual offset trades are often hard to come by, so ex-ante evaluation of offset policies is one of the main ways we can actually work out whether they are likely to achieve no net loss. In work led by Laura Sonter and Nicole Tomsett, we evaluated the current offset approach being used in Queensland, Australia, with a focus on an endangered habitat type (Brigalow woodland). Offsets for the loss of habitat in Queensland are topical, not least because of vast proposed coal mines (such as Adani’s Carmichael mine). We showed how sensitive offset outcomes were to the rates of deforestation that are considered to be ‘business as usual’ – a major issue when Queensland’s land clearing laws and rates change dramatically from government to government. Even so, in none of the scenarios that we examined did the current policy achieve a no net loss outcome for either vegetation extent or bird habitat quality. Martine Maron, Melissa Walsh, Nicole Shumway and Jon Brodie. 2016. Final Report for project 3.12 of the NESP Tropical Water Quality Hub. Controversial as it may be, development continues to impact on Australia’s Great Barrier Reef Marine Park and World Heritage Area. Because of the nature of the marine and coastal environment, offsets delivered directly by proponents can be particularly challenging. We advised the Australian Government on the development of a tool that could assist potential approval holders and relevant agencies in determining appropriate financial payments as offsets under the Reef Trust. It extended the methodology currently used to calculate terrestrial offsets (which our group led the development of in 2012) to the marine setting. Melissa Walsh is now leading the second phase of this project to develop a working calculator. This article was first published on the ALERT blog, and describes the recent actions by leading scientists to slow the loss of Australia’s native ecosystems. “If we continue down this path, the cost to society and the economy will be enormous — and largely irreversible. We will face higher temperatures, more severe droughts, and see iconic species pushed to extinction”.